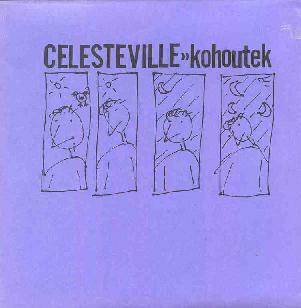 From Portland, Oregon, Celesteville is the solo project of a gentleman named Jacob Anderson, whose music is characterized by lo-fi pop with frequent forays into experimental guitar and strings of various sorts. Actually it sounds like a mandolin might be one of his main instruments. Anderson's guitar work is really what keeps things interesting throughout, utilizing intricate strumming and rhythmic patterns that incorporate healthy doses of dissonance and make it all a prominent backdrop for his songs. Among the highlight tracks is "Waverly", which demonstrates that though this may be lo-fi, this guy can write songs with powerful melodies and orchestral fullness. I like the dissonant strumming on "Victoria I". It sounds like a prepared guitar or mandolin or something like that. Then Anderson moves into an eerie experimental piano segment that sounds like Derek Bailey playing on a pop song. Frenetic, kinetic, adventurously insane, and just damned wild! "Council Bluffs" is quite a freakout, striking me as a psychedelic cross between the Residents and Revolution #9. "Avoid" is a quirky, robotic-dancey electro song. "Appear To Be" is the album's one thrash-bang rock 'n roll song. But "For To Pour", "Cry", and "Victoria II" are my favorites, featuring some seriously cool guitar patterns that are melodically dissonant but creatively complex. "Cry" is a standout track that is a bit more on the tripped out experimental spacey side. Pretty interesting stuff. Anderson offers up a variety that includes songs and lo-fi adventure. For more information you can visit the Tape Mountain site at: http://tapemountain.tripod.com. Contact via snail mail c/o Jacob Anderson/Tape Mtn; 1803 SE Washington #2; Portland, OR 97214.